A cheerful squad of urban agitators are using Rotterdam to conduct quirky experiments in social mobility. Is this car-centric city ready to rethink its use of space? Deborah Nicholls-Lee finds out more. If you wake up one morning to find your street covered in pink and yellow dots, a lawn where once there was a parking space, or a bike-through cafe in your neighbour’s front room, then it might be the work of Happy Streets, a mischievous but well-meaning group of urban activists, with a mission to reclaim the streets of Rotterdam for people rather than cars. 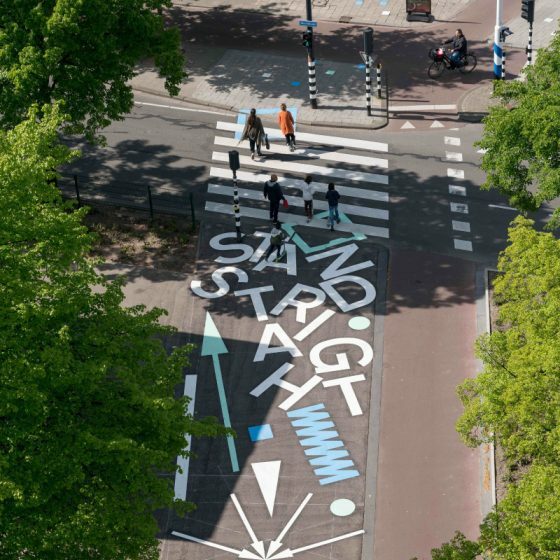 Working in association with DRIFT, Veld Academie and the local council, Happy Streets uses urban experiments to trial more inclusive and sustainable mobility concepts. Rotterdam is an atypical Dutch city with a biking culture that is far less entrenched. Much of the city was flattened by German bombers in the 1940 blitz and had to be totally rebuilt. While cities like Amsterdam,The Hague and Utrecht were structured around a medieval canal system, this new city was built with cars in mind. Now that the city has become more congested, residents are increasingly open to alternatives. ‘In the last 10 years, we have had an incredible rise in bicycles here,’ says Wemmenhove, but he admits that it has been a battle to change existing patterns of mobility. Happy Streets’ playful approach to tackling the problem is refreshing. 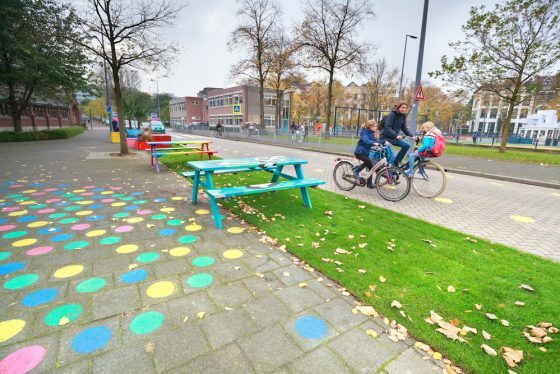 Recent projects have included creating a temporary bike lane with painted yellow dots to demonstrate that there is room for cyclists, converting parking slots to astro-turfed picnic areas furnished with benches and deck chairs, and creating a pavement version of the game Twister. Such projects have encouraged residents and policy makers to take another look at the purposing of city spaces, and consider alternative, less car-centric models. Tactical urbanism, it seems, is spreading. In one part of town – quite independent of Happy Streets – local residents recently took matters into their own hands and painted their own pedestrian crossing to show that they needed one. The group are currently developing a Happy Streets Index, a research-based tool to help policy makers identify the uses of space which make people happiest. ‘If you create places that are nice to be, people in general adjust their behaviour,’ says Wemmenhove, giving the example of the reported correlation between access to green spaces and a sense of wellbeing. Green spaces are healthier too. 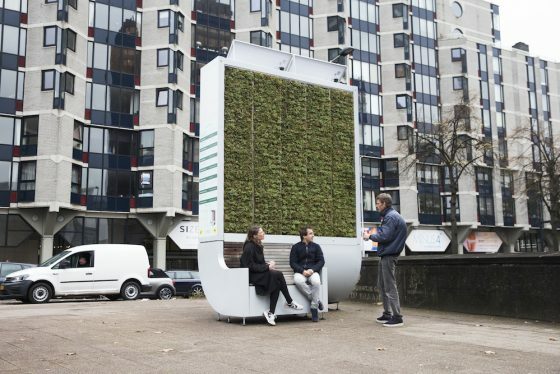 Happy Streets recently helped bring a City Tree to Rotterdam: a solar-powered, self-watering wall of moss with an integrated park bench. The tree helps produce 25% cleaner air, and is an example of a landscaping solution which is architecturally interesting, social, and environmental. Happy Streets describes itself as a beweging van gewone Rotterdammers (a movement of ordinary Rotterdammers), seeing mobility as something which can be solved from a neighbourhood point of view. He gives the example of a local butcher who was furious about losing parking spaces for his customers, but now wants to get involved with the project. ‘Maybe we can find a solution which suits him but fits in our philosophy as well.’ It’s about ‘creating trust’ and ‘really working together’, he says. The initiatives give people a taste of the future and suggest some bold alternatives to the way the city uses space today. If the interventions are popular, then work can be done to make them permanent. The possibilities are boundless.